Halloween is associated with all kinds of horrors, including the dreaded “sugar rush” amongst the very young (and also the older), but it also has its lovely life-giving and charitable side, often embodied in the haunted house. The tradition of Halloween charity is a long one. Some children were even talked into raising money for UNICEF in lieu of candy as far back as the World War II era. But more recently, the relationship between Halloween and charity has changed shape. When I was a kid, I converted our family garage into a haunted house to raise money for the Muscular Dystrophy Association, which I knew back then as Jerry’s Kids. With some Christmas lights, aluminum foil, and a card table, I transformed a hidden room that had housed a still during the Prohibition Era into Frankenstein’s lab. A large cardboard box doubled as Dracula’s coffin and I played an LP soundtrack of very scary Halloween noises that I listened to so often that I still remember it. It seems that the haunted house industry is born of charity fundraisers, including those operated by the Jaycees in the mid 1970s. In those days, haunted houses were usually staffed by volunteers and took place in vacant buildings for one night. Later, in the 1980s, they transformed into large, for-profit local attractions. With the advent of the Internet and broadband, haunted houses could showcase videos, photos, logos and more, enabling the worldwide promotion of their events as high-end attractions. 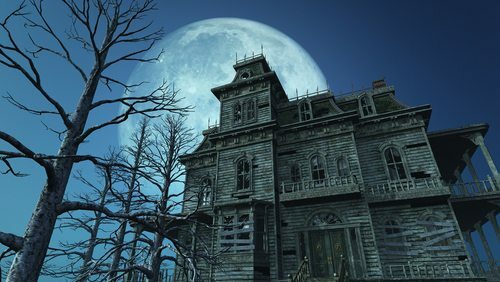 Today, there are people from all over the world who travel from city to city in search of haunted houses, many of which employ the kind of acting talent and special effects used in big budget horror films. I thought it would be fun to dig through the listings of haunted houses across the U.S. and exhume some of the more interesting spook factories that either solely donate proceeds for nonprofits or provide some significant support to nonprofit organizations. It does not escape us that some of these attractions exploit either real disasters of the human spirit with real human victims, while others heighten irrational fears about “others.” We’d rather they stuck to the zombies and ghouls, but so it goes. Just reporting the facts. Below are 13 Halloween attractions, in no particular order, that are giving back to their communities while scaring the bejesus out of them. Know of others? Feel free to add them to the comment section below! The Hundred Acres Manor (Pittsburgh, Pa.): Attractions include the haunted Massacre Manor; a visit with a family that suffered long, horrible deaths while trapped in a fallout shelter; an abandoned meatpacking factory known as the Brine Slaughterhouse; 7,500 square feet of terror in The Maze; and South Valley Hospital, where botched surgeries, accidental deaths, mind-altering drug experimentation, and other unspeakable horrors reportedly occurred. Proceeds benefit a number of local nonprofit organizations. Powerhouse of Terror (Toronto, On. ): This multi-faceted Halloween theme park is located in the now-abandoned Power House Recreation Centre. Visitors are treated to a variety of attractions including CarnEvil Manor, where creepy carnival workers roam, Quarantine 2 – Zombie Apocalypse, and The Darkness haunted house. All proceeds benefit local charities. Scare for a Cure (Austin, Texas): Scare For a Cure is a nonprofit organization that raises money for local cancer charities “one scream at a time.” This year’s attraction, Summer Camp Massacre, sold out in mid-October, but those lucky enough to have tickets can leaf through the (Tumblr) pages of Gretchen’s diary before checking in. Axmanship, knife sharpening, and grave digging seem to be the most popular merit badges. Hangman’s House of Horrors (Fort Worth, Texas): According to legend, an angry lynch mob finally put an end to the murderous rampage of Hezekiah Jones, a man known as “the Hangman.” At night, Jones would stalk his victims along the banks of the Trinity River and string them up. Now, his ghost haunts visitors to the Hangman’s House of Horrors, which celebrates its 24th year as one of the top charity-benefiting haunted houses in the nation. According to the organization, the house has entertained over half a million victims and donated more than $1.7 million to local charities to date. Bloodview Haunted House (Broadview Heights, Ohio): Located between Akron and Cleveland, Bloodview Haunted House is operated by the local Lions Club to raise money for local nonprofit organizations and is staffed entirely by volunteers. Visitors who survive the bloody trek through the gore house follow a cemetery path where various “undesirables” and “destitutes” try to survive the harsh wilderness. As patrons reach the main house, they are surrounded by the dead and undead. Terror Behind the Walls (Philadelphia, Pa.): This haunted house takes place at and benefits Eastern State Penitentiary, a historic, 11-acre prison that once housed Willie Sutton and Al Capone. From the yard to the gauntlet to the infirmary and beyond, six attractions at different cellblocks within the prison terrify visiting inmates. Can’t you just hear the sound of rusty prison doors slamming shut? Acres of Darkness (Chattanooga, Tenn.): Visitors take a tour of a haunted forest where creatures of the night lurk behind bushes and trees to terrify passers by. Acres of Darkness is a fundraising event to benefit the Chattanooga Audubon Society. Macabre Cinema and Chambers of Edgar Allen Poe (Kansas City, Mo. ): Both attractions are 501(c)(3)s operated by Full Moon productions and all proceeds benefit The Dream Factory of Greater Kansas City. Macabre Cinema takes guests through the action of classic and contemporary horror scenes in a haunted 1930s movie theatre that covers four floors and a dungeon. Chambers of Edgar Allen Poe allows visitors to experience the terrors of The Raven, The House of Usher, Rue Morgue, The Black Cat and other Poe tales come to life. Netherworld (Atlanta, Ga.): Walking through this dark attraction has been compared to stepping into a horror film. Filled with terrifying live actors and amazing special effects, this intense, multi-story, multi-attraction haunted event is full of amazing detail and thrilling scares. Widely considered one of the best haunted houses in the nation, Netherworld donates 3,500 tickets, valued at nearly $100,000, during its annual Charity Opening Weekend. The Dent Schoolhouse (Cincinnati, Ohio): Ohio boasts a large number of some of the best haunted house attractions in the country. The Dent Schoolhouse tells the story of Charlie, a former janitor, who was wanted in the disappearance of a number of school children in the ‘40s and ‘50s. Today, it’s rumored that the ghosts of Charlie and his victims roam the corridors and classrooms. The Dent Schoolhouse hosts an annual 5K Zombie Walk to raise money for the Juvenile Diabetes Research Foundation. Darkwing Manor & Morguetorium (Medford, Ore.): Guests join Baron and Baroness Reuwsaat in their Victorian haven for vampyres and other creatures of the night and receive tours of the funerary museum and haunted grounds. Proceeds Benefit the Children’s Advocacy Center of Jackson County. Haunted Mines (Colorado Springs, Colo.): Raising money for the Western Museum of Mining and Industry and other local nonprofits, the Haunted Mines are constructed on the historic, 26-acre grounds of the museum. At one point during the attraction, visitors crawl on their hands and knees to escape from the mines and there are even real bats! The 13th Gate (Baton Rouge, La. ): For more than 13 years, the 13th Gate has been collecting blood for The Blood Center of New Orleans. Guests journey through 13 frightening indoor and outdoor areas where they crawl through a burning crematory oven, get lost in dark underground caverns, and find themselves standing on a rickety bridge overlooking hundreds of live snakes. This 40,000-square-foot haunted house was ranked the 2012 #1 haunt in the country by hauntworld.com. Clearly, the industry retains its charitable roots. According to Hauntworld Magazine, more than 80 percent of all haunted attractions across America are operated by a charity or help to benefit a charity of some kind, raising tens of millions of dollars for charities nationwide. “Haunts” have worked with major nonprofit organizations such as Boys and Girls Clubs, Children’s Miracle Network, and continue to help support a frightful number of local organizations. Like a kid dangling a rubber spider in front of his friends, it seems that some among us still can’t get enough of Halloween haunts.